Eternal God and Father, we praise you that you have made people to share life together and to reflect your glory in the world. We thank you now for Dr. Greg Patron for all that we saw of your goodness and love in his life and for all that he means to each one of us. As we too journey towards death may we do so in the company of Jesus, who came to share our life that we might share the life of eternity. To him be glory with you and the Holy Spirit for ever and ever. Amen. Dr. Greg Patron passed away today April 26, 2009. He is a visiting associate professor of the DLSU ME Department every 3rd term and teaches Methods of Research to the 3rd year civil engineering students. To our friend and colleague, we will miss you. The DLSU Alumni Association COE-Civil Engineering Subchapter - AnimoSibil launched the AnimoSibil - Jose Aliling Basketball Tournament 2009 last April 24, 2009 at the DLSU PE Building. The tournament aims to foster camaraderie among students, faculty and civil engineers and staff from construction and consultancy firms where Lasallain CE alumni are employed. This is the 2nd edition of the alumni basketball tournament which started in 2008. Portion of the proceeds of the tournament will go to charity. Here are photos taken by Joenel Galupino during the event. The alumni and students are invited to support the teams during the tournament which will be held at the DLSU PE Gym during the summer vacation. Cheers to Prof. Hiroo Niiyama! 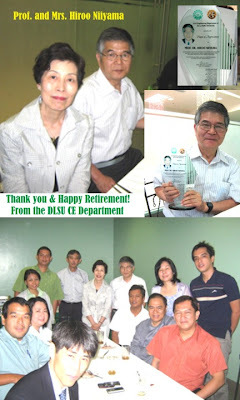 The CE Department faculty and staff hosted a send-off lunch party for Prof. Hiroo Niiyama of Tokyo Institute of Technology last March 30, 2009 at La Casita, Andrew Gonzales Building. Prof. Niiyama is the professor in-charge of the TokyoTech Office-Manila. Present during the party were Mrs. Niiyama and Prof. Jiro Takemura who will be one of the TokyoTech faculty in-charge of the Manila office. The party was led by Engr. Ronnie Gallardo - CE Dept. chair and manager of the TokyoTech Office-Manila. The Lasallian Excellence Awards 2009 - 2 out of 4! 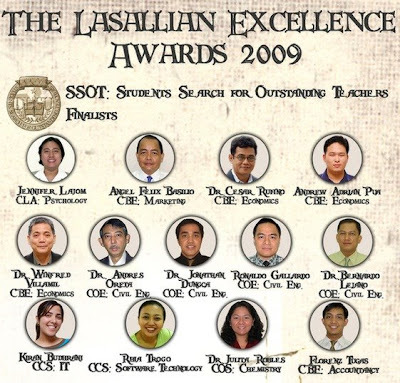 CE Department professor, Dr. Andy Oreta and associate professor, Dr. Jonathan Dungca were among the four winners (2 from COE, 1 from CBE and 1 from CCS) in the Lasallian Excellence Awards 2009 for Outstanding Teachers. The winners were announced during the awarding ceremonies last March 28, 2009. The awards include a trophy, medal and gift certificates from Starbucks and Sun Cruises, Inc. Dr. Oreta teaches Mechanics, Computer Methods and Structural Engineering related subjects. He has been teaching at DLSU for 15 years. Dr. Dungca, on the otherhand, teaches Mathematics, Mechanics and Geotechnical Engineering related subjects. Incidentally, associate professor, Dr. Bernardo Lejano and assistant professor and department chair, Ronaldo Gallardo were also finalists in the Students' Search for Outstanding Teachers (SSOT 2009). The criteria for the selection of finalists includes students and peer evaluation on teaching, track record in research, participation in university and college activities and community service involvement. The SSOT is a project of the Council of Student Organizations. Lasallian Civil Engineers: Shaping the World! Welcome Lasallian Faculty, Students, Alumni, Parents, Administrators and Fellow Civil Engineers! “Animo” represents the Lasallian spirit, “CIV” is the degree code for Civil Engineering at DLSU-Manila, while the star symbol is the star of faith which serves as a guide in all the department’s endeavors. Hence AnimoCIVnews is an expression of the department’s commitment and burning spirit to train competent and well-rounded civil engineers for God and country.